Competing anglers on this fifteenth qualifier of the 2018 Mega Match This campaign were met by flat calm conditions with bright sunshine pushing temperatures up to 27 degrees by mid-afternoon. The conditions, coupled with the number of pegs put in by the venue on Falcon Lake, had anglers preparing for a difficult match with Skylark being the lake that most wanted to draw. As it turned out, it was Skylark that produced the best of the weights but, that said, the fishing was as prolific as ever with all sections on Falcon being won with weights over 100lbs with twenty (20) weights over the ton recorded during the weigh in. Andy Bennett will now fish his second Mega Match This final in three years after topping a competitive qualifier event at Westwood Lakes. Winner on the day and booking his second Mega Match This Grand Final appearance in three years was Tri-Cast / Guru’s Andy Bennett. Andy drew peg 42 on Skylark and decided to keep things simple throughout the match feeding a mere two bags of pellets and one tin of corn down the edge on either side with corn on the hook. Andy was able to maintain a steady catch rate throughout the day to amass a winning total of 221lbs of carp to 8lb. As well as qualifying for this year’s Mega Match This event, Andy also qualifies for the Maver British Pole Championships in August. Finishing close behind and taking runner-up spot was Mark Taylor (Nottinghamshire). 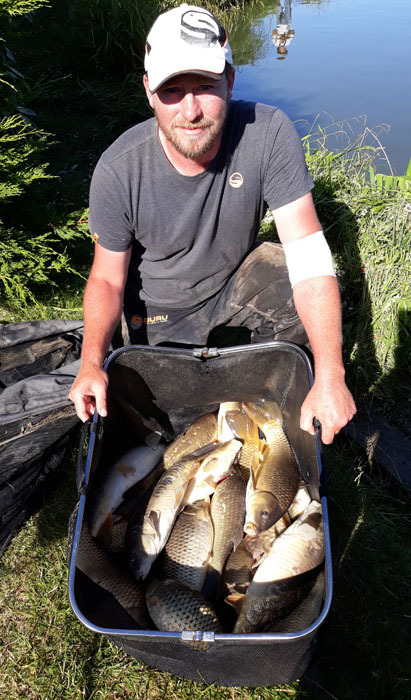 Mark drew peg 39, also on Skylark, and opted for an all out pellet attack feeding four pints of 4mm pellets down his edge and fishing short with 6mm soft pellet hook bait. Mark finished the match with carp to 10lb for 208-10-00 and will now join Andy on August 19th in the Maver British Pole Championship final. Luke Bamford (Nottinghamshire) secured a third place finish from peg 24 on Skylark with a level 201lbs. Fishing paste short and down the edge, Luke found fish to 7lb for a total weight of 201lbs.